Located in the Great Lakes system at the end of Lake Erie, the City of Buffalo can be described as “water rich,” with nearby water bodies including Lake Erie, the Niagara River, Black Rock Canal, Cazenovia Creek and Scajaquada Creek. Though the Great Lakes contain one-fifth of the world’s fresh surface water, they are very fragile. These lakes are essentially glacial puddles – ones that receive only 1% of their volume in new inputs from annual rain and snowfall. This understanding makes it all the more important that every community takes actions to preserve and protect our water. Each year, Buffalo residents, businesses and visitors use billions of gallons of water for drinking, food, cleaning, health care, industry use and recreation. Before the creation of sewer systems, that water would all be directed to local waterways, which would pollute our water and spread disease. We work to fix that. 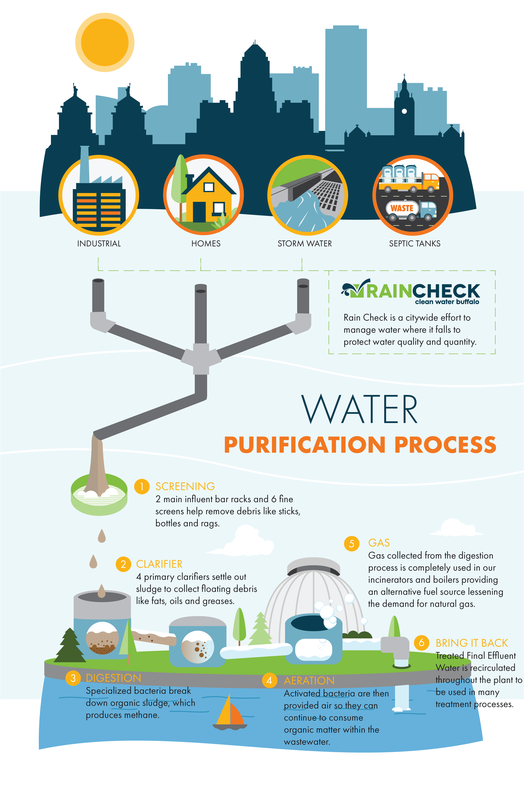 Our treatment and cleaning of water is only part of the process – through our water purification steps, we help turn wastewater into energy.